In an age dominated by the idea of gay marriage, one of the founding fathers of homosexual liberation asks where Queer culture has gone. Many people have forecast the end of gay culture in recent years. Indeed, even the very word ‘gay’ seems to have become a quaint memory, misused as a term of general abuse among the young and replaced in politically aware circles by the meatier ‘Queer’ or the ever-enlarging string of letters that indicate a compulsively inclusive mindset. Dennis Altman, the great gay granddaddy of us all, has weighed in with his new book, The End of the Homosexual?, a deliberately provocative title that asks us to pause and measure both the achievements and losses of 40 years of gay politics. Some have hoped that Altman would summon up some of that old radical fire in this book, pouring forth a declamatory denunciation of the comfortable Queer middle class. But those seeking a new manifesto might be sadly disappointed. What Altman has written instead is a considered and even mellow meditation on recent homosexual history. The End of the Homosexual? is a book that is ultimately wise and measured, the kind of book you’d expect from a man who has seen the gay community in a million different manifestations at home and abroad, and who has himself been subject to the cruel ups and downs of intellectual and political fashion. There is a great deal of nostalgia in the book for a lost world where being gay meant that you were a dangerous, romantic outlaw and not a plump middle manager with a mortgage and long-term partner. Altman describes the shifting geographies of our cities, where the places that were once soaked with possibilities of homoeroticism have become CCTV-monitored sites of elevated real-estate value. ‘The old warehouses along the Melbourne docks,’ he writes sadly, ‘once the home of wild dance parties, have disappeared in the urban renewal that has produced the sanitised streets of Docklands.’ The great irony of our age is that the partying young queers who made our cities liveable once more have become the grumbling old queens complaining about the noisy crowds and 24-hour licences they helped usher in. What tantalises me most about The End of the Homosexual? is the moments of autobiography. Altman has led a most fascinating life, and he provides the reader with brief and intriguing glimpses of it, from his innocent and inexplicable crushes on other boys in the early 1960s through to addressing audiences of intellectuals and activists across the world in the 21st century in the capacity of elder Queer statesman. Altman’s own life serves as testimony to the length and bitterness of the struggle for Queer recognition and our slow passage towards acceptance. He reminds us that it was only in 1975 that South Australia became the first Australian state to enact homosexual law reform. It was in 1971 that Altman himself began his career as gay rights activist. … with new affirmation came new commercial spaces, whose patrons seemed to flaunt their acceptance of sexual diversity as bars opened up to the streets, while, ironically, the creation of new commercial venues for sexual adventure killed off street cruising. Even more ironic that on-line culture has now killed off the commercial venues that rose, so briefly and gloriously, from the ashes of sexual subterfuge and illegality. Altman’s occasional prickliness in the face of comfortable Queer achievement is admirable and certainly entertaining. His capacity to aggravate is fully acknowledged, and he is almost misty-eyed at the memory of being booed off the stage at a gay rights function. His recent uneasiness over gay marriage, and his wondering over whether gay culture and lesbian culture might not be totally separate things, all prove his continued willingness to provoke, as we’d expect from an old radical. 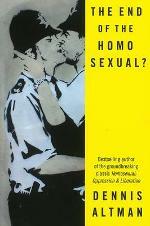 A cultural history, a Queer memoir and an extended meditation on the politics of identity, The End of the Homosexual? is an important book that should, that must, be read by a new generation of the proudly sexually diverse. It reminds us how far we’ve come, and asks some salient questions about where we might want to go.